It’s Christmas week! So much to talk about – first off, the final Mercury retrograde of 2016 officially starts on Monday, 19 December. Mercury, the planetary ruler of communications, technology and travel, goes into a backspin until 8 January 2017. Watch out for potential SNAFUs in comm, tech and travel: back up your work frequently, stay calm and communicate clearly when interpersonal hiccups arise, double-check any contracts you might be signing, bring a book to read in case of flight delays. Some good folk I know are terribly frightened of Mercury retrogrades. Fear not, my darlings! Nothing that happens in the cosmos is a waste – or a coincidence. Mercury retrogrades do serve a purpose in our lives – they can be useful periods for us to slow down, reflect and do some necessary inner work on ourselves. Universal movements and energies can increase the likelihood of certain outcomes arising, but don’t guarantee that they will happen – because we can (and should) exercise our free will as co-creators of our destinies. So be of good cheer, and hang in there! Also of note: Sagittarius season segues into Capricorn season on 21 December. The hitherto free-spirited, fiery energies of the festive season are settling and grounding themselves into something more earthy and practical. In the coming days, many of us will become increasingly thoughtful about what 2017 may bring. It’s a good time to start brainstorming resolutions – and figuring out how you’re going to keep them! 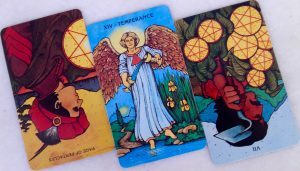 Ready for This Week’s Tarot? Here we go! LEFT: PAGE OF PENTACLES REVERSED. When this normally focused and diligent little Page is turned upside-down, there are indications that you’re feeling distracted and/or uncertain about the situation you’re facing. Various people and priorities may be pulling you in different directions, and you’re finding it hard to concentrate. Times like these, a to-do list might help you streamline your tasks more efficiently. Steady wins the race! MIDDLE: TEMPERANCE. At the core of This Week’s Tarot, Spirit is encouraging us: Get your act together! True, we’re in the festive (read: party) season and yes, the Mercury retrograde is here. Big deal. There’s no excuse for not stepping up to co-create the life we want. For many of us, the end of the year is an especially busy and significant time. We owe it to ourselves to give of our best and end 2016 on a high note – not use last night’s hangover as an excuse for inefficiency, or blame a planet when holiday plans go awry. Think. Plan. Focus on solutions. Get it together! RIGHT: SEVEN OF PENTACLES REVERSED. Is an overdue task, deadline or matter calling your name? When reversed, this card sometimes indicates a gentle warning against procrastination. Its meaning here fits in nicely with the lack of focus indicated in the reversed Page of Pentacles. The message is simple: dear one, you know what you have to do. Get on it. Be a little extra careful since it’s the Mercury retrograde, but no slacking, either – Get. A. Move. On. And may you be blessed richly!